Wow what a great weekend it’s been and thank you to everyone for coming to Country Fest. Popular this year was the daring Jason Smyth Adrenaline Tour, as well as the very amusing Terrier Racing with a couple of dogs going in the wrong direction completely causing a giggle. Great fun and both events thoroughly entertained the crowd gathered around the Lloyd South Lakes Arena. The Fell Pony Display Team received great applause for their routine and the classic motorcycles, historic vehicles and an impromptu kite display were all well received. Prizes were given on Sunday by Deputy President, Susie Bagot, to all the outstanding bakers in the AGA Bake a Cake Competition and thank you to the AGA Shop in Kendal for generously donating all the prizes. The McClures Food Theatre was packed again with people enjoying the cookery demonstrations and the Sew Crafty, Vintage Revival, WI Marquee and ever popular Food Zone were all busy again. 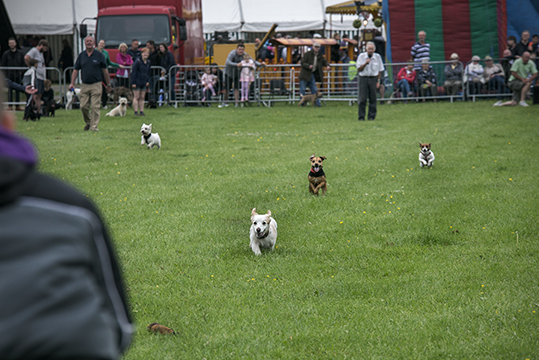 The Terrier Show had a good number of entries in all classes and the Westmorland Veterinary Group helped present the rosettes to the Overall Champion and Reserve. North West Flowers were at Country Fest for the first time and have had a fabulous weekend. Another first this year was paper cup recycling in partnership with James Cropper PLC, South Lakeland District Council and Cumbria Waste and thanks to everyone who recycled their used cups. Celebrating 10 years, the Westmorland Agricultural Society wants to say thank you to all the visitors who have supported Country Fest and we look forward to welcoming you all back again next year for another super weekend.